Made.com works with designers and furniture makers from around the world to source its collection – which it describes as “beautiful, high-quality items at a fraction of the price of high street retailers”. This retailer also asks users to vote for their favourite designs and thus help determine what gets made – which reduces both waste and costs, meaning Make.com can pass the savings on to its customers. 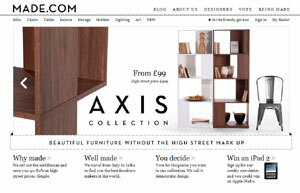 New collections are launched every week with ranges including furniture, home décor, and other lifestyle products. Shop at Made.com if you are looking for sofas, armchairs, dining chairs, bean bags, side tables, coffee tables, desks, shelves, storage units, lighting, and art. Lifestlye products currently include bikes and table football. Take a look – it could be just the furniture retailer you need. Categorised under Consumer news, Our partners, tagged under furniture, lighting, Made.com, storage.